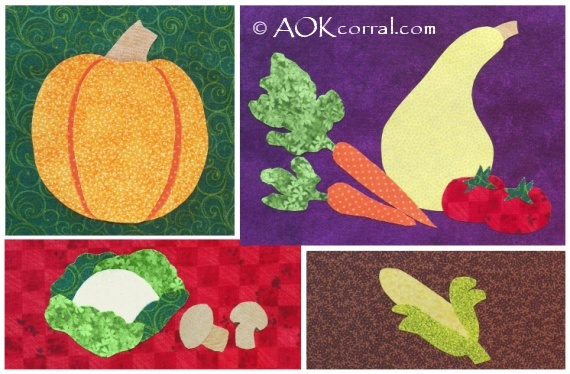 Make appliques for a garden quilt, table runner, kitchen project or more with our vegetable applique pattern set. The Easy Print Version contains the pumpkin, 7 other vegetable patterns, a bonus garden rabbit pattern, and instructions. Cut out all the pattern pieces for the vegetables that you wish to appliqué. Cut the fusible adhesive paper around the whole group of traced patterns. Repeat steps 2 through 7 with each other fabric color. Follow the pattern placement guide if needed to stack the pieces in the correct order when bonding. Add this applique to quilt blocks, table runners, kitchen linens and more! Get the whole set and create a garden quilt! *This version includes Pumpkin pattern Plus patterns for Carrots, Tomotoes, Corn, Lettuce, Mushrooms, Squash, and a Garden Rabbit.